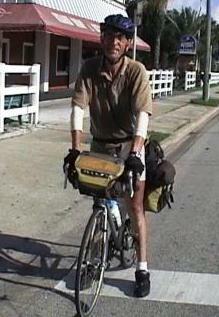 I rode my bike up beside an older cyclist who was stopped at a Daytona Beach stoplight heading south on U.S. Highway 1. He was studying a map. He looked like a seasoned rider and, with the panniers on his rear-wheel carrier, perhaps out for a day trip. “Do you know where you are going?” I asked. “Miami!” I exclaimed, incredulous. Miami was about 300 miles down the highway, at least a three-day ride.I queried further. “Washington, D.C.,” the man replied. I was picking up some European accent.“Where do you live?” I plied, as the light changed and we rode forward together. For the next fifteen miles I engaged in a pedaling conversation with a most interesting character. Robert was sixty-six and originally from Holland. He had cycled cross-country quite extensively in Europe and Asia. This was his first ride in America. He had started in D.C. ten days before. Robert would be meeting up with his brother who lives in Miami in a few days and then flying back to France before the start of the Tour de France. Robert had interesting observations about the Americans he had thus far encountered on his trek. I hope my encounter with him left him with a better impression than others had. At least I was not astonishingly overweight as most other Americans appeared to him to be. Hoping to get pointers for my upcoming ride in India (Bicycle India 2007), I asked him questions about his cross-country travels, looking for areas of special care, foresight, etc. He seemed to have traveled without much incident. He recommended larger tires, as I had just had put on the black Cannondale I was riding. He said he had not had a puncture on such tires in over two years and several thousand miles. He did not tune up his bike. He had had no breakdowns of equipment in years, he said. Basic maintenance only is necessary, Robert insisted. Perhaps I will be able to do in ten or fifteen years what Robert is doing--riding solo across various countries. He recommended Vietnam and China as two very nice places to bicycle cross-country. He also commented how much he liked riding in southern Italy.I broke the fellowship of the ride in New Smyrna Beach, bidding Robert farewell. I hope he reaches Miami safely. He invited me to contact him if I ever want to ride in Europe or see the Tour de France. I may just take him up on the offer!